As our population ages, the individuals born towards the end of the baby boomer generation are gaining new responsibility in caring for their elderly parents. While statistics support the fact that adult daughters are usually the responsible party as their parents age, sons are rapidly gaining in popularity as caregivers. Learning how to parent a parent in your home takes some skill, intelligence, and an infinite amount of patience. Step 1: Discuss the expectations and living arrangements for the future with your loved one. Your loved one will thrive in a home environment but may decline quickly if institutionalized, even in nice, healthy, safe environments. If at all possible, your loved one should be invited to move into a family home. Of course, this creates the so called “sandwich generation” – those people caring for their children and their parents at the same time. For those who take on the challenge of caregiving, however, the time spent may be the most wonderful, rewarding times of their lives. Communication is key if you are going to understand how to parent a parent in your home. Before the invitation is accepted to move into a family home, all parties should have a meeting to discuss the requirements and expectations for the new living arrangements. Discussing financial arrangements is key to going forward with a successful household. Depending, of course, on the financial situation, your loved one should be expected to contribute to the family expenses. Discussing how much will be contributed to rent and food might not be an easy conversation but it is critical in avoiding future conflicts. Knowing how to parent a parent in your home will have an effect on each family member’s life. Having parents move into the home will be less disruptive if all parties know there will be an adjustment period – and it may not be a honeymoon. Younger children may feel resentful that their parent’s attention and time is now divided. Make an effort to set aside one-on-one time with each child every day to strengthen relationships and show them that life will go on. Step 3: Prepare a safe environment for the senior in the home. 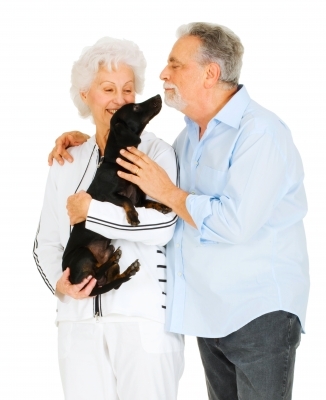 Step 4: If possible, allow seniors to bring along their pets. There is a lot to consider when determining how to parent a parent in your home, and pets could be one of those things. For many seniors, their closest friends and confidants may be a pet. Your parent may have a dog that might not be your choice of borders but, if possible, allow them to bring their pet with them. Not only are dogs and cats cathartic in reducing blood pressure, but, by having their friend beside them, your loved one may have an easier adjustment to their new life. It can be very stressful for your loved one to have to send a beloved pet off because he or she is not wanted. Honor the bond your mother or father may have and welcome their animals into the home. Step 5: Continue to engage your loved one in family decisions. Seniors may be feeling helpless and not respected as the head of the family any longer as they start depending on others for their care. That’s why it’s important to take extra cautions to get input from them and alleviate their fears of being a burden. Continue to ask their advice for decisions and draw them into the family as the figurehead. Step 6: Give seniors choices. Moving in and being cared for by a child turns the parent-child relationship upside down. So that your loved one may continue to feel in control, give choices when possible. When fixing breakfast, allow them to tell you what they’d like and then make it. When scheduling doctor appointments, allow them to set the day and time they’d prefer to go. Ask if they’d like to go to a child’s baseball game rather than assuming that they’re coming along. Step 7: Have a discussion with your elders about how they want to be treated in the case that they become ill. Although it might be a very painful topic to discuss, death is inevitable. In the case that your loved one is no longer thriving, every party should know what actions they would want taken. Assure them that you’ll be right there with them and will abide by their wishes. If at all possible, try to keep your elder in the family home and let them know that those are your wishes. But, of course, if safety is an issue, there is no choice but to search out and employ a clean, safe nursing home. We hope these tips have helped you understand how to parent a parent in your home. It won’t be easy, but with the right preparation and communication, it can be a wonderful time for everyone involved.